Secured in open competition through the Homes and Communities Agency’s (HCA) Delivery Partner Panel, the Drakes Place development transformed a long-vacant brownfield site that was owned by the HCA, creating 75 much-needed new homes. The joint venture between Wates Residential and the HCA provided 49 homes for private sale, 26 for affordable rent and six for shared ownership, split across a mix of contemporary one and two bedroom flats and two and three bedroom houses. 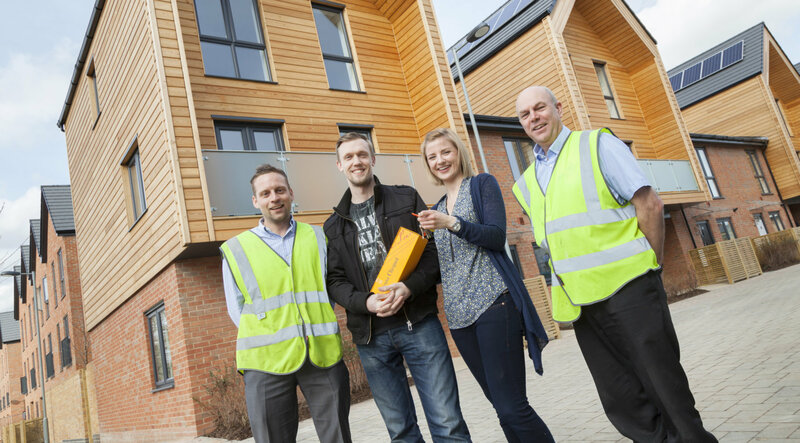 Catalyst Housing has taken ownership of the affordable rental and shared ownership homes. Wates JV experience led to the agreement adopted with the HCA which enabled a share of development risk and reward, creating £500k+ of overage revenue for the HCA whilst allowing Wates to achieve cost recovery and a small blended developer margin. Once planning was obtained and pre-commencement conditions satisfied, the lease agreement with HCA enabled Wates to take possession of the site and build the homes under licence. One of the key project challenges was to deliver the 26 affordable homes by March 2015 to achieve the HCA funding delivery milestone, requiring accelerated delivery. Increased resources were allocated to dual-track the affordable housing phase, enabling our team to meet the funding deadline despite extended severe weather events flooding the site. Wates successfully achieved a fast pace of sales by differentiating the product with quality of design and construction, creating high levels of demand translating to sales. The sub-structure included works for demolition of the existing slab and foundations to the former Bearbrook House and hard standing which was on the site previously. A detailed flood risk assessment identified the need to raise site levels by 600mm to mitigate the potential risk caused by the adjacent brook. Traditional masonry construction was used for the superstructure to accord with the programme and forecasted sales rates to achieve the optimum returns for the HCA. On-site highways were designed as ‘home zones’ with shared surfaces and all constructed to adoptable standards. Our robust project management ensured the highest quality delivery and maintenance of the design integrity of the scheme. This is evidenced with recognition at the NHBC Quality Awards and the Single Home Commendation Awards 2015. Shortlisted from over 15,000 site managers across the UK, Site Manager Steve Bennett was awarded the NHBC Pride in the Job Seal of Excellence for achieving a high standard of site management on the development at Drakes Place. The site also achieved an outstanding Considerate Constructors Scheme (CCS) score of 43, thanks to setting exemplar site standards, excellent communication with our workforce, and engaging with the community. Our unique delivery model for Drake’s Place incentivised us to maximise values to generate cost and margin recovery whilst simultaneously maximising overage for the HCA. All homes were sold by Wates Residential with all units sold ahead of programme, creating significant value overage for the HCA. Wates set up a joint Steering Board with the HCA which held overall control of the regeneration programme and was responsible for signing off key stages of the project including design, tenure mix, community engagement strategies and delivery plans, build and sales programme, key build materials and finishes (such as bricks / windows / kitchens / bathrooms) and sales including release values and sales rates. Excellence in aftercare has been delivered to residents of all tenures, with Wates and Catalyst’s respective Customer Care Managers working out of the same local office and providing personal, customer specific service for all residents and purchasers. Delivering mixed tenure housing schemes.